The Resnicks are known for their billion-dollar-feel-good empire, including brands like Teleflora, Fiji Water, and Wonderful Pistachios (famously known for its “Get Crackin’” ad campaign). But most folks aren’t aware of how this Beverly Hills power couple is shaping California water rules to maintain and expand their empire. 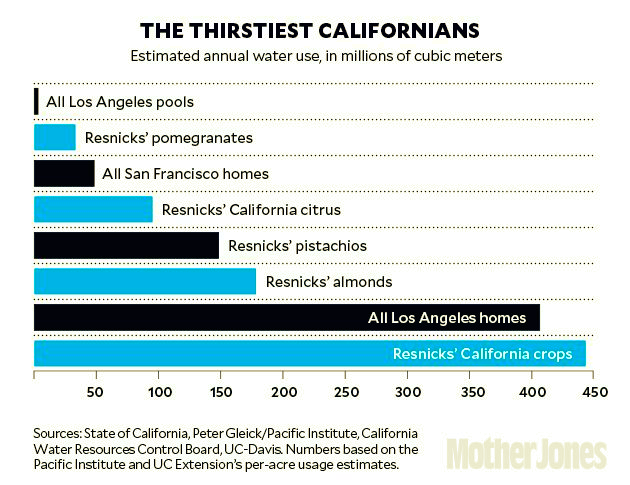 In this feature, Mother Jones reporter Josh Harkinson explores the how the Resnicks’ Wonderful Company came to control more of California’s water in some years than the residents of Los Angeles and the Bay Area combined. Please share this story far and wide this week with your supporters, especially through your social media channels. We are the media! "I think the Wonderful Company and the Resnicks are truly the top 1 percent wrapped in a green veneer, a veneer of social justice," says Barbara Barrigan-Parrilla of Restore the Delta. "The tunnels would completely bypass the ecologically sensitive Delta, eliminating much of the smelt-endangering pumping–and, by extension, many of the restrictions on Delta water diversions that have crimped the Resnicks' supply." NOTE: Delta Tunnels evidentiary hearings continue today with testimony regarding modeling of the project. Watch it today and throughout the week every day starting at 9 am. Link to watch live. Catch up by checking out our live tweeting at Twitter.com/RestoretheDelta. Stop the Delta Tunnels Project! Taking Public Wealth and Privatizing it for Wealthy Billionaire Couple in Southern California is appolling! Sticking it to tax Payors through property taxes, and water bills to benefit a few? This will devistated the eco system and wetlands of the Delta as well as allow salt water to back up from the Ocean! Also Fiji Water is actually Sacramento Water? Shame on Jerry Brown for ruining our State! California fish and other native species can tolerate the salt in the summer. The invaders since 1840 much less so. The estuary would be brackish without the pumps. Find a way to preserve Delta livelihoods without the pumps. Restore the Delta save our River! This State already has a mess with the Oroville Dam! With Fema disappearing, Droughts, Earthquakes, farmers struggling, Salmon endangered, and a fragile eco system Brown wants to put the Delta Tunnels thru for Billionaires in Southern California, and make Tax Payors on top of 12 cent gas tax, see higher property taxes, and water bills??? Fiji Water actually Sacramento Water? The water greed has got to stop. Leave it alone. “Destroying” one area so another can benefit is absolutely insane. Humans have changed the Delta once, that’s enough….